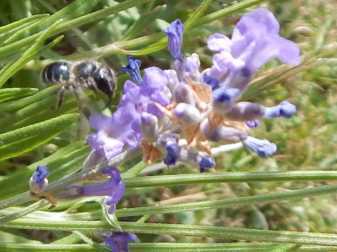 Blue mason bee - Osmia caerluscens (female) foraging on lavender. The smaller, solitary bees that visit our gardens are quite easy to miss. 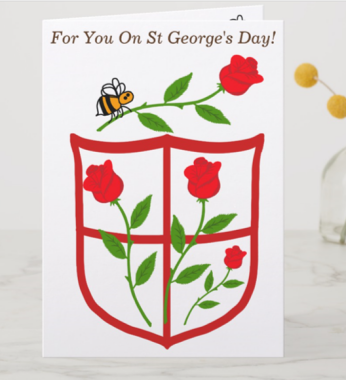 We are so used to looking out for the larger, bumbling bumble bees, or the more dainty honey bee, that many species (save perhaps for some of the more commonly known ones, such as leafcutter bees), simply escape general awareness. 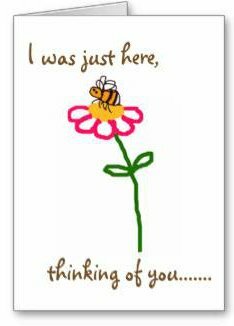 But it's always worth remembering that most bee species are actually solitary! So why not make it your mission to become more familiar with the lesser known species that may cross your path - some of which are actually quite common? You could start in your garden or back yard if you have plenty of flowers. If not, check out your local park land planting scheme, or flowery verge. From spring to mid-summer, remember to look out for the blue mason bee - Osmia caerluscens (not to be confused with the blue orchard mason bee - Osmia lignaria). This species is found in Britain (mostly in England and Wales), as well as other parts of Europe, North America, and reportedly in East Asia, India and North Africa. They belong to the Megachillidae family of bees. It's a small bee, with the female measuring about 7 to 8.5mm, and the males slightly smaller - about 5 to 6mm. These dark bees have a slight metallic turquoise/bluish tinge to the body. On females, the body segments (tergites) have a narrow white fringe of hair, and if you can get close enough (and for long enough) you might catch a glimpse of white hairs on the legs). 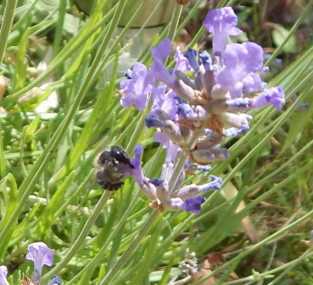 If you have lavender in your garden, you might well attract blue mason bees! Which flowers do blue mason bees visit? 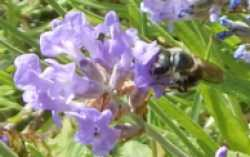 In gardens, watch out for Osmia caerluscens on lavender, catmint (nepeta) and snapdragon (Antirrhinum). You might also spot them on clovers, sainfoin, bird's foot trefoil and other legumes, as well as woundworts found on brownfield sites and wildflower verges. The photographs on this page were taken in my garden. Blue mason bees are small, dark bees with a tinge of metallic blue, but they are easy to miss! Nesting occurs in pre-existing holes and cavities in hollow plant stems (so don't burn old stalks when tidying - if you must cut them back, leave them in a pile at the rear of the garden); as well as soft old pieces of wood or mortar. Nest cells are constructed using bits of leaf and chewed up petals to create partitions for the cell walls. 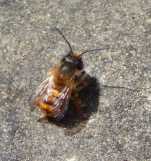 These bees may rear a second generation in late summer if conditions are favourable.